Thread: Hello From Ontario, Canada! I belong to another Stinger forum but came across this one and couldn't resist joining you guys! 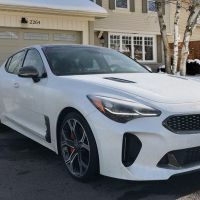 I have a 2018 Atomic Blue Kia Stinger GT Limited (in Canada that's the one with the twin turbo V6, AWD, and all the options). No mods but I completely rebadged the rims, steering wheel, and front emblems with E badges, and the rear with the large Stinger script. I have 3 booster seats in the back for my kids, and I drive it year round (non-staggered multi-spoke rims on Blizzaks during winter). I feel this car will be a collector's car many, many years from now, so I plan to keep it stock (aside from the rebadging - I kept the old ones...). Anyways, thanks for having me! P.S. Pic taken last fall. Winter rims installed. Last edited by SomeBlondeGuy; 04-15-2019 at 12:15 PM. Sorry about the bin in the background. But doesn't the bin contrast well with the car? Welcome to the forums, car looks great! !